Apromix, an Italian system integrator and supplier of RFID systems for access control, utilizes HITAG as a logical further development of magnetic stripe cards. In order to safeguard existing investments and infrastructure, Apromix offers its customers HITAG magnetic stripe cards and specially designed, combined reader devices. HITAG cards are being encoded in a special way, so that the software used for the magnetic stripe cards can easily be used again. For Apromix’s customers the HITAG gate has proven successful for complex identification demands. 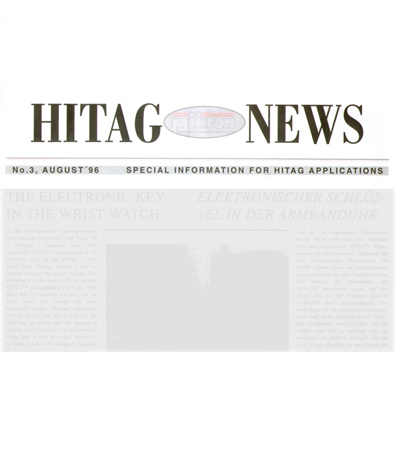 An industrial company with more than 800 employees going in and out per shift utilizes the HITAG gate for real “handsfree” access control. Therefore, the gate was equipped with a flexible control unit and photo cells. Now the system can detect moving directions and give alarm in case of unauthorized access. The gate allows the identification of about 110 persons per minute. The transponders are programmed for a smooth integration into any staff time and attendance recording system.